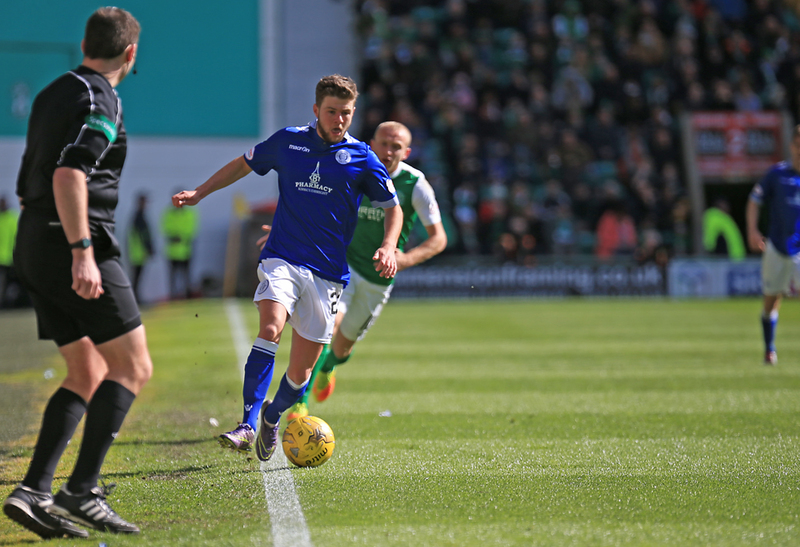 The Doonhamers slipped to sixth in the Championship table after an emphatic 3-0 defeat at Easter Road, with Hibernian crowned league champions. Gary Naysmith`s men were second best all afternoon and were put to the sword by a first-half Darren McGregor double and David Gray strike. 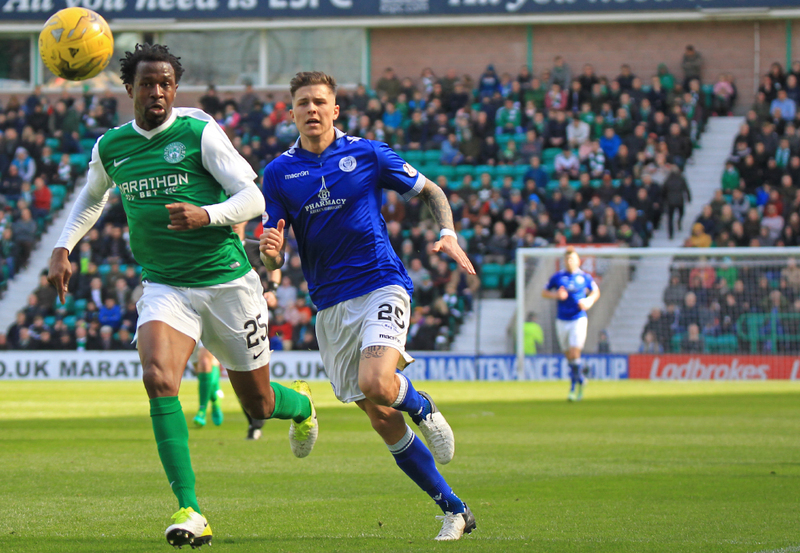 The buzz around the sold-out Easter Road proved to be too strong for Queens to handle and found themselves up against it from the off. Influential midfielder John McGinn created space in the middle of the park on 8 minutes and the Scottish internationalist lined up a long-range strike from 25-yards but he couldn`t direct the ball on target. The hosts continued to bombard Queens with early pressure when Martin Boyle shrugged off left-back Jordan Marshall, advanced into the box and attempted to curl the ball into the net, but Lee Robinson palmed the striker`s effort away. Queens had their first attempt on goal on 10 minutes when on-loan winger Dom Thomas managed to create space and fired a shot inches wide of Ofir Marciano`s goal. The breakthrough came on 13 minutes for Neil Lennon`s side when McGinn`s perfect free-kick found Darren McGregor at the back post and looped his header over Robinson and into the net. The Hibs supporters` cheers turned to jeers in a matter of seconds when referee Barry Cook blew for a home free-kick when Cummings looked to be on course to double their lead immediately. The man in the middle blew his whistle when John Rankin fouled Andrew Shinnie on the half-way line and booked the Queens captain for his troubles. The visitors could`ve levelled the contest five minutes later when Stephen Dobbie latched onto the ball in the penalty area. The striker hit a superb shot but was saved by the magnificent Marciano and the follow-up knocked out for a corner. Play was halted for a few moments when Rankin and Fraser Fyvie clashed heads but it was the hosts who looked likely to go further ahead, this time a long-range shot from on-loan Celtic defender Efe Ambrose sailed over the bar. Naysmith`s men did create another chance moments later as Marshall`s well-time delivery landed at Joe Thomson`s feet but his shot flew wide. 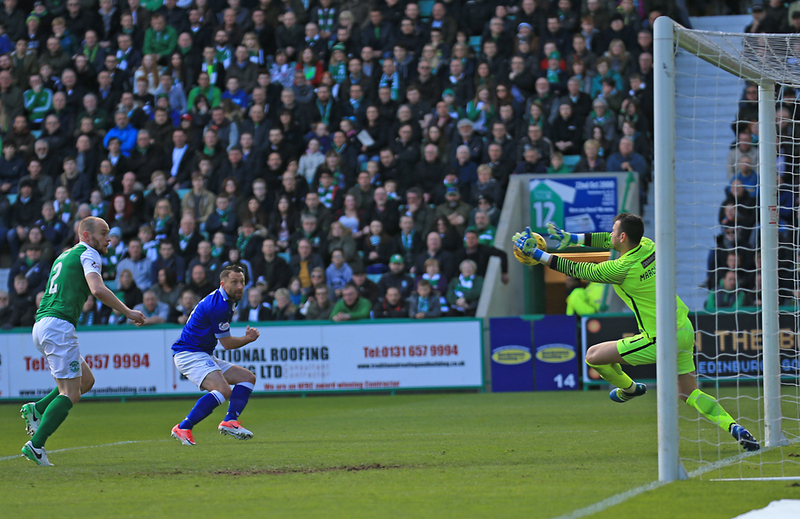 The Easter Road outfit were on the march once more, this time Andrew Shinnie`s effort deflected out for a corner. And the hosts would double their lead. Cummings sent in a corner and was met by McGregor again, this time with his right foot to send the home support into hysterics on 39 minutes. The hosts all but sealed the victory three minutes from the restart. 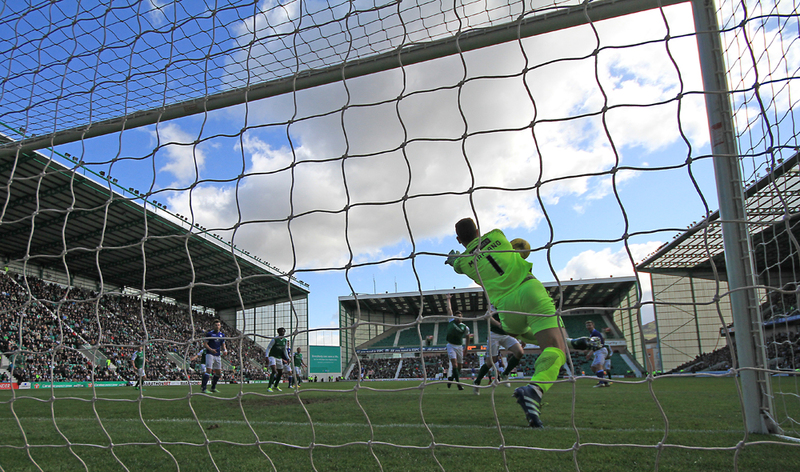 Cummings shot was parried wide by Robinson and from the resulting corner Hibees captain David Gray rose above the Doonhamers` defence to nod in at the back post. Hibs weren`t content on finishing at three and Queens had Robinson to thank, once again, for keeping out a Dylan McGeouch strike. Queens made two substitutions on 57 minutes. Wingers Carmichael and Thomas were withdrawn for youngsters Connor McManus and Connor Murray. The home support at this point had one eye on the Falkirk fixture, if Falkirk dropped points they would be crowned champions. And the roar from the home support rung round Easter Road, they knew they were minutes away from Championship glory. Queens had an attempt to grab a consolation when Marshall was picked out by McManus on the left, the defender squared to Murray but the youngsters effort glanced wide. Naysmith made his final change of the afternoon, Dale Hilson replacing Lyndon Dykes. 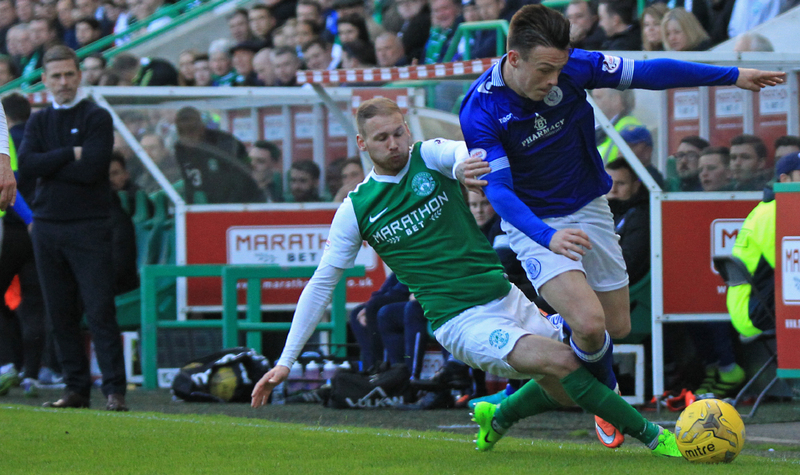 Hibs substitutes Alex Harris and James Keatings combined late on but the latter missed the target from four yards. There was little action until Barry Cook blew for full-time and it was official Hibernian crowned 2016/17 Championship champions. The defeat, coupled with Dunfermline`s 2-0 victory at Dumbarton, sees the Doonhamers drop to sixth in the league with three league matches remaining. Queens host Dumbarton next week, with Stevie Aitken`s side looking for three points to ease their relegation worries. 14:53 Hibs: Marciano, Gray, McGinn, Fyvie,McGeouch, Stevenson, Boyle, Shinnie, McGregor, Ambrose, Cummings. 15:00 The teams are out and we`re only moments from kick-off at a packed out Easter Road. 4 min McGeouch`s ball over the top is collected by Robinson. 7 min McGinn tries his luck from long rnage but his shot is always rising. 9 min Boyle out muscles Marshall and has a shot but Robinson saves. 13 min Thomas hits a low effort from 20-yards inches wide of Marciano`s post. 14 min McGregor loops his header over Robinson to the delight of the home fans. 16 min Rankin cautioned for a foul on the half-way line. Home support aren`t happy as Cummings was through on goal but the referee brought it back. 17 min Marciano makes a superb save from a close range Dobbie strike. The ball falls back to him but his effort is blocked out for a corner. 29 min Marshall whips in from the left, Thomson connects but his effort flies wide. 33 min Shinnies shot deflected out for a corner. Cummings to take. 34 min McGinn gets on the end but is always drifting wide. 39 min Robinson tips a Boyle shot wide from the corner McGregor makes it 2-0. 47 min Cummings shot is saved by Robinson and the follow-up is knocked out by Marshall for a corner. 54 min McGinn gets past two Queens players, lays the ball to McGeouch but his shot is saved by Robinson. 75 min Murray`s shot is wide of the goal. 78 min Keatings skies from close range. 81 min All Hibs here at the moment. 90+2 min Late chance for Cummings is saved by Robinson.